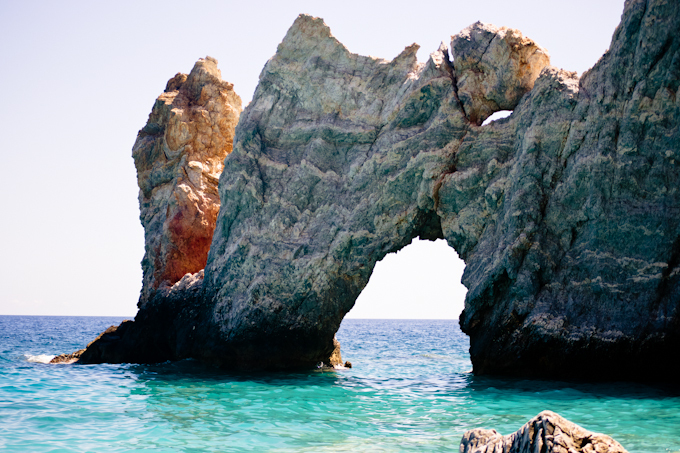 This set of images is from our last day on Skiathos when we visited the famous Lalaria beach. I had heard and read so so much about the beauty of this beach (it's considered one of the prettiest beaches in the world) and honestly it didn't disappoint me even for a bit! Hidden away and only accessible by boat, a beach with smooth and round pebbles and crystal clear, bright blue waters, Lalaria is a real gem! Definitely the most gorgeous beach I've even been to and one of the most beautiful places I've ever visited. Hope you'll enjoy our photos there guys! Αυτό το σετ φωτογραφιών είναι από την τελευταία μας μέρα στην Σκιάθο όταν επισκεφθήκαμε τη διάσημη παραλία στα Λαλάρια. Είχα ακούσει και διαβάσει τόσο πολλά για την ομορφιά αυτής της παραλίας (θεωρείται απ'τις ωραιότερες στον κόσμο) και ειλικρινά δεν με απογοήτευσε στο ελάχιστο! Σε ένα απόμερο μέρος προσβάσιμο μόνο με βάρκα, μια παραλία με απαλά στρόγγυλα βότσαλα, τα Λαλάρια ήταν πραγματικός παράδεισος! Σίγουρα η καλύτερη παραλία που έχω πάει και ένα απ'τα πιο όμορφα μέρη που έχω επισκεφθεί. Ελπίζω να απολαύσετε τις φωτογραφίες μας εκεί καλοί μου! Υπέροχη παραλία! (στο γραψα και στο instagram! )και συ σαν την Αριελ εδώ!! omg outstanding beach and such gorgeous photos you've taken there! You look absolutely gorgeous! Your hair, the place, the swimsuit... perfection! I love your swimsuit and everything about these pics! Oooh WOW such amazing pictures! The view is amazing! Woaw! So beautiful pics! The scenery is amazing! These are beautiful shots! Greek beaches are amazing and I love your swimsuit. You’re so incredibly lucky, it looks so beautiful. Lovely pictures, you have a fabulous figure! Really amazing place…just like heaven! Waaw those pics are so beautiful!! So gorgeous, it looks like paradise! Amazing place and beautiful shots, you’re gorgeous ! Pretty like a mermaid. Incredible photos also! You look like a real life mermaid. Love your swimsuit! these photos really took my breath! the beach is magnificent and you look so pretty! Para poli omorfes fwtografies! Distixws den eixa episkeftei tin paralia autin otan episkeftika to nisi. These are some truly incredible pics!!! You look adorable!